Welcome to our first newsletter of 2015 bringing you an update on all Environment Team is doing to safeguard Norfolk's outstanding wildlife, landscapes and heritage. Got a question for us? Please get in touch. In partnership with UEA, Environment Team is employing two postgraduate interns to help with fine-scale mapping of local green infrastructure. Matt Thorne and Alice Saunders (see 'meet the team') are mapping existing and potential green infrastructure in the north-west of Norwich, along the Marriott’s Way and at Wymondham. Their work feeds into the Greater Norwich Infrastructure Plan, co-ordinated by a local partnership which includes Norfolk County Council, which will manage the infrastructure required to deliver 37,000 new homes by 2026. Green infrastructure is not just a ‘nice thing’ to have in the context of new development – it is a requirement under Conservation of Habitats and Species Regulations 2010 for local authority partners to mitigate for the impacts of growth on sites designated for biodiversity. 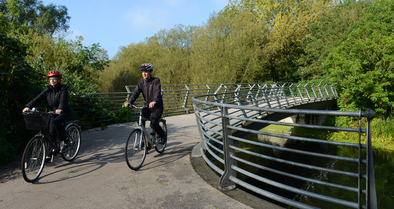 New and enhanced green infrastructure that is well connected – such as parks, footpaths, green cycle ways, allotments and gardens - provides space for wildlife and access to nature for people on a daily basis, helping to take the pressure off more fragile, protected nature conservation sites. Read more here. A new European Regulation to manage the rapidly growing threat from invasive non-native species - such as floating pennywort (Hydrocotyle ranunculoides) pictured above - came into force on 1st January 2015. The Regulation will provide extra measures to help protect our ecosystems, economy and native biodiversity and is warmly welcomed by staff in the Environment Team. The new rules will use three types of intervention: prevention; early warning; and management, to stop new invasive species from entering the EU and ensure that those that are already established are dealt with more effectively. Member States will have between one and three years to put in place the new measures which will ban the importing, selling and growing of the most problematic invasive 'alien' species. At the heart of the new Regulation is a list of ‘Priority invasive alien species of EU concern’. Member States will work together over the next 12 months to produce and prioritise the list which will be uncapped, but drawn up using the most up-to-date and sophisticated risk assessment methodologies. Regional lists will also be produced, where enhanced co-operation between Member States is needed. This might be where a species is native to one part of the EU but an invasive alien in another state - such as killer shrimp (Dikerogammarus villosus). ● Results from the European RINSE partnership project (Reducing the Impacts of Invasive Species in Europe) led by Norfolk County Council will give the region a head start with compiling regional lists of problem invasive species - read more here. ● Across the EU, expenditure on invasive non-native species is estimated at 1.4 billion Euros per year, of which 1.3 billion is spent on the management of established species. ● Floating pennywort is one of the most invasive aquatic plants in Norfolk. Capable of growing at up to 20cm a day, this plant can rapidly block waterways. Environment Team's Norfolk Non-native Species Initiative (NNNSI) led work to eradicate the plant from the River Waveney, helping to protect the Broads from this damaging species. The project cost less than £50,000 over 5 years, with all money coming from external sources. In other UK rivers, it has cost this amount in a single year just to keep the central channel clear, with no prospect of eradication! Read more here (2nd story down). The renaissance of north Norfolk’s rare and precious chalk rivers continues, with the recent opening of a wildlife watching hide on the banks of the Glaven river at the Natural Surroundings centre on the Bayfield Estate near Holt. As well as a hide, the £11,000 building is an outdoor classroom, a place to train volunteers and hold events for community groups. Arranged through Norfolk Rivers Trust and Norfolk Coast Partnership’s 9 Chalk Rivers Project, its safe dipping platform will provide local schools, communities and interest groups with a sheltered place by the river to study the impressive wildlife. 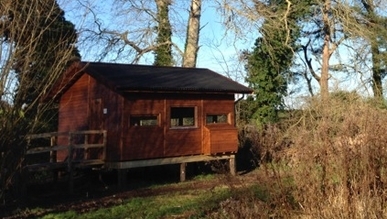 The hide accommodates around 20, includes a ramp for access and viewing windows looking out over the river, woodland and reserve and was supplied and erected by local firm Custom Made Wooden Buildings at Heath Farm, Holt. This November, for the third year, Norfolk Historic Environment Service handed over control of our departments to young people from Norfolk. 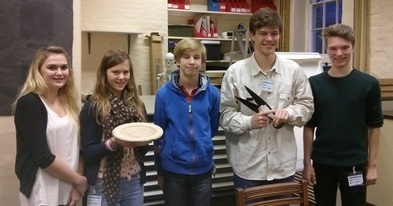 Six young people joined us at our offices in Gressenhall to become Historic Environment Officers for the day. Kyran and Josh took over as Community Archaeologists; Alex became the Senior Historic Environment Officer for Planning, while Chloe and Amy took on the role of Finds Liaison Officers. The idea of the day was for young people to see (and do!) our everyday jobs, to see what exactly their county council does, and to tell us how our services can work better for them. They met finders, identified artefacts, made comments on archaeological reports to be sent to a contractor, produced publicity material for our upcoming training events and planned archaeology workshops for primary schools. Norfolk Historic Environment Service also organises several week long work experience placements for GCSE and A Level students every year. Get in touch if you know a young person this may benefit! In this edition we meet our Environment Team Green Infrastructure interns, Alice Saunders and Matt Thorne. Working with Norfolk Trails and Natural Environment Team keeps me busy with GIS mapping of green infrastructure, ecological network maps, working on content for Norfolk Trails and creating maps of potential new projects for funding bids – you can tell I quite like maps! I also spend a lot of time working on the Norfolk Trails website content and engaging with the public at events, through social media and the ‘Explore Norfolk Trails’ blog – have a read to see what we’ve been up to. My interest is Landscape History, so working on the preservation, enhancement and engagement of the landscape is fantastic!. Catch up with the Norfolk Trails blog here. My main responsibilities are to produce a range of maps for the Norfolk Trails and Natural Environment teams. I've only been in the Council a few months and have already had the opportunity to map Norfolk's cycling routes, Green Infrastructure around Norwich (if it isn't green, it isn't worth mapping) and researching different methods for highlighting Biodiversity-related corridors. My favourite colour, as you may have guessed, is green. However, that isn't the only reason I decided to apply for the role. I am also determined to see Norfolk's environment flourish, not only enhancing our resilience to Climate Change, but seeing people enjoy it too. What I have really loved about working here since my arrival has been the heart-felt welcome and care I have received from colleagues, in the office and across the Council. Hence, if you find yourself in Room 301 (or see me on floor 6 after the move), please do come and say hi. It would be great to speak to you. Matt has developed and writes for the biodiversity blog - keep up with all the news here. 1. Try the 2.5 mile short coastal walk from Cart Gap to Sea Palling (part of the brand new stretch of coast path opened in December) recommended by Norfolk Trails at Environment Team. Download the walk here. Follow us on Twitter for all the latest Norfolk Trails news. 2. 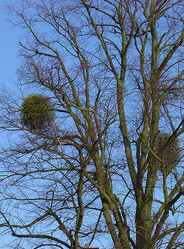 Send in your sightings of mistletoe - see above photograph by Andrew Fogg and reproduced under the terms of a Creative Commons licence. To check your identification and to submit a record to Norfolk Biodiversity Information Service (NBIS), click here. 3. View our team video (click the image above). Our mission is to enable Norfolk to grow whilst ensuring that the natural and historic environments are safeguarded and appreciated. We enable businesses to develop in a sustainable way and provide opportunities for residents and visitors to enjoy the outstanding countryside Norfolk has to offer.